In order to reproduce brain signals like electroencephalography (EEG), one has to consider biological inspired and plausible models like neural mass models. The neuronal currents underlying the generation of EEG are assumed to be generated by the postsynaptic potentials (PSPs) of pyramidal cells. A cortical area can be described by three neural masses: pyramidal cells, excitatory and inhibitory interneurons, strongly interacting by positive and negative feedback loops . Due to the cortical organization, short- and long-range connections establish afferent pathways on interneurons, which are of major importance for top-down and lateral connections . To date, there is no systematic analysis of the impact of extrinsic inputs on pyramidal cells and interneurons. In our model we consider extrinsic inputs on all three neural masses. With the bifurcation theory  we analyzed the impact of extrinsic inputs and dendritic parameters. We produced bifurcation diagrams, which are suitable compact representations of system states. They allow for far reaching predictions concerning the possible dynamic behavior. The type of insight achieved by our analysis is exemplified in the Fig. 1. 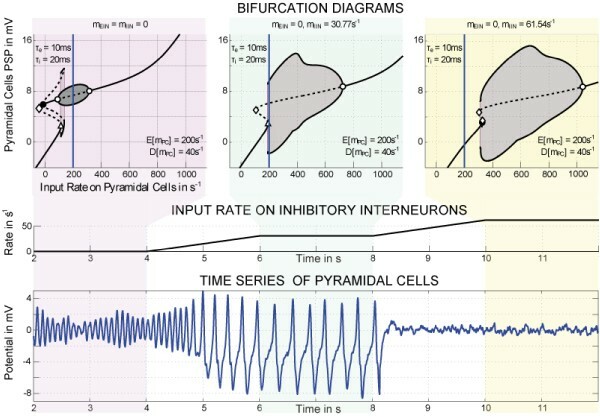 We started with Jansen's configuration (input on pyramidal cells), and increased the extrinsic input on inhibitory interneurons by two steps. For each step we obtained a bifurcation. The PSPs of the pyramidal cells switch from alpha activity to spiking like activity in the second state and noise driven activity in the last state. The bifurcation diagrams detail the influence of the changing inputs onto the system. The alpha activity is caused by Hopf cycles in the first state and the epileptic spiking like activity of the second state is caused by homoclinic cycles (Sil'nikov bifurcation). In the last state the system is out of reach of any limit cycle and attracted to the equilibrium. Impact of input on inhibitory interneurons. A whole range of new dynamic phenomena could be described, which potentially form the basis for important phenomena in brain function and the associated features in brain signals. We found various biologically interesting branches of limit cycles, providing sudden entering into orbits by small variation of inputs for instance. Extrinsic inputs on interneurons can change the behavior of the system dramatically, e.g. forcing the system to produce various oscillatory activities. The impact of afferents on inhibitory interneurons is greater than on excitatory interneurons. Activities like alpha rhythms can be changed but not suppressed by inputs on inhibitory interneurons.